My name is Angie Benson, six years ago through mobile screening I was diagnosed with breast cancer and was told I needed surgery, which involved a complete mastectomy of one of my breasts and full lymph gland clearance (ASAP). To be told about such life threatening news did not register at the time; I may as well have been told it was a wisdom tooth that had to be removed. A damned inconvenience was my first thoughts. The reason for this bizarre reaction was because at this time I had a sister who had been diagnosed with cancer only year ago (not breast cancer) and was incurable. Most of my energy had gone into supporting her along with my other sister. Both my sisters were with me when the consultant gave my diagnoses. I turned to look a my sister with cancer, tears in her eyes, and then turning to my other sister who had been with us both when we had got this great bombshell of news, whatever fears may she be having now. Then my thoughts fled to my three grown children a daughter and two sons, are they safe or at risk? My mom and dad oh no, how would they cope having just come to terms with the future of loosing a daughter and now to be told another has this damn bloody cancer. I went home to tell my family who were all anxiously waiting for my results. My husband first, but somehow he knew and just reached out his arms and held me tight. He was and still is a tower of support to me in all I do. He told our children and close relatives and friends, my two sisters went to tell mum and dad. The next day I was to be in theatre, my younger sister took me into hospital for eight AM, then went back to take my other sister to see her consultant, what a dear sister she has become. The surgery went well, and later I was told I would need chemotherapy and radiotherapy and were put on Tamoxifen drugs, for five years. Two days after my surgery my sister’s condition took a downward slide and although she did become well enough to go home after me, we did both go for chemo treatments together along with our other sister, the hospital called us the three degrees. Sadly! Five months later my sister lost her fight, the loss of her is still as painful today. This at the time was really hard, however it did not make me dwell with thoughts of may this happen to me, so after a while I turned a negative part of my life into a very, positive one and so with the help of a fantastic family who gave me some much of themselves and a wonderful caring Breast Care Nurse, all helped me get through some very hard months and I began to get into a sort of normal life again, what ever that was. I went along to Bosom Pals (breast support group in Scunthorpe founded by a lovely lady Joy Wilkinson). A Breast Cancer Organiser asked me if I would think about training to become an Outreach Worker for Breast Cancer Care after she came to give a talk to the group at one of its meetings. Not long after I was asked to start a support group in Brigg (my home town), this was just what I needed a good kick start to begin what has become my greatest passion and I’m sure part of my mission in life, to offer compassion and love and care, to give back part of myself to those that have supported me along my never ending path of now truly living, valuing each brand new day. But sadly Joy wanted to retire and asked me to think about taking over her support group. After talking about this with my family, because the time I would have to put into doing this may affect them. But together we decided two support groups would be too much to take on, so I did lots of home work which included research and fundraising canvassing; all this took what seems endless months of behind the scenes work all with the help of my family. Then I had to find a place in Brigg that would suit all needs of all members and asked those people interested and Joys group to come to our first meeting to try and see if we could bring the two groups together and fix a date for our monthly meetings choose a committee etc, so this is how Brigg & District Breast Cancer Support Group was first formed at The Carer’s Support Centre in Brigg. 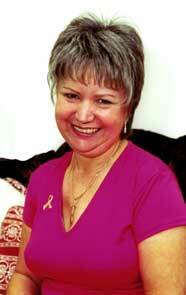 I did take up the offer and trained, and became an Outreach Worker for Breast Cancer Care, before our group began. One of the things an Outreach worker can do is to talk privately to another who has had breast cancer this can be by phone or face to face visits and offer support, understanding, to have empathy with them, to let them know you are there for them. This I did with the support of my breast care nurse and family. Soon because of the success of our group we had to move to bigger premises where we are today, The Angel Suite, in Brigg. I am Vice–Chair now after being Chair for first two years, we have a great guy Jim who is Chairperson and we have a good hard working committee Debra - Secretary, Rose - Treasurer, Carolyn and Michelle who look after our fundraising and social events. Also helping out with our press releases and photos are Christine and Simon Boone, and my sister Jan and friend Jean, who greet all our members with a cuppa on arrival. Jan also is to be in charge of our group’s lending library due to set off next month. Rose, Carolyn, Michelle, Jan and Jean all joined the group and committee at our very first meeting along with Kay, who gave me so much encouragement and support, who’s sadly has now passed away. From the beginning of our Group it was decided that every two years our Committee would change, where and if possible. From then I have been Chair twice and Vice-Chair once. I was very proud when I was made the Honorary Founder Member of the Group. Another proud moment for me was in 2002. I was given the Joseph Margrath OBE award for founding our Group and supporting Breast Cancer sufferers and their families. This is given out each year to nominated candidates that our Town Council vote upon. However my proudest moment of all is when I look back and to the present and see how much our Group has helped and supported members and the community. This has been achieved by sincere and dedicated committees and other members of the Group all giving their time voluntarily to the Group's welfare with aim of simply just to CARE. Since the writing of my story, Debra, Jean, my dear Mom & Dad and my beloved soulmate and husband have all sadly passed away. Each one of them gave me so much of themselves in supporting myself and our Group. Bless You All. All our sponsors, donaters, fundraisers and behind the scene helpers. I founded our Group but everyone of you .... past, present and the future ..... make our Group.